Kladder Update: Thinking Spring & March Madness! Spring is here! And I’m all jazzed up because I finally bought myself a power washer! Watch out Rosewood, I’m coming for ya. You thought I was a tyrant with the leaf blower but now I’ve got water power, baby! Thanks, Amazon. The kids and I spent nearly 3 hours outdoors Sunday afternoon and it was glorious. I raked 4 extremely full bins of yard waste while they played in our dirt patch of a backyard. They went immediately in the bathtub as soon as we were back inside. The driveway gate my Dad made for us last Fall was incredibly useful, if at the very least for my peace of mind. And despite Watermark still being closed, Jeff found his way onto a different golf course and also spent the afternoon outside. So officially, Spring is here! 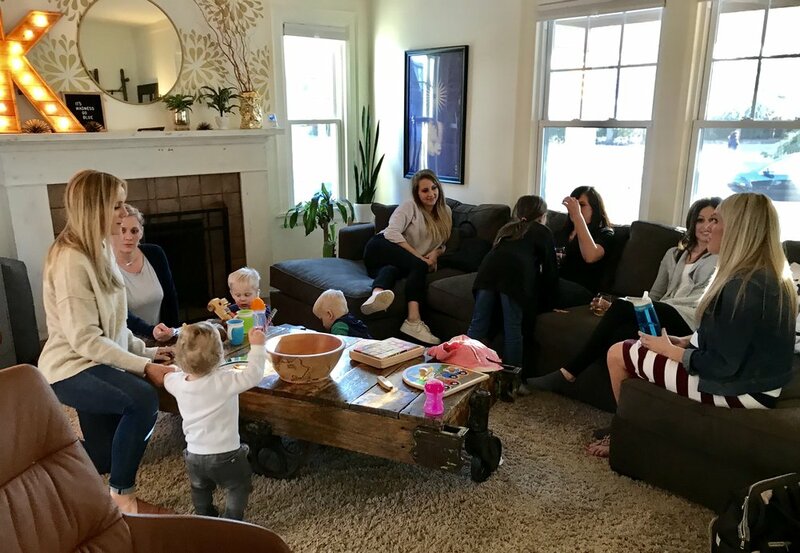 On Friday we hosted what felt like an entire basketball rosters worth of people at our house (35 people total including adults and kids) for a March Madness party and needless to say, it was a full house. Since before my time Jeff and his high school buddies have gathered to watch the games. Each March they would skip class to watch basketball and over the years skipping class turned into skipping work. And when they got married, the wives were invited to join and eventually their kids too. The event has always been loud but in today’s version the ambiance has reached a whole new level. 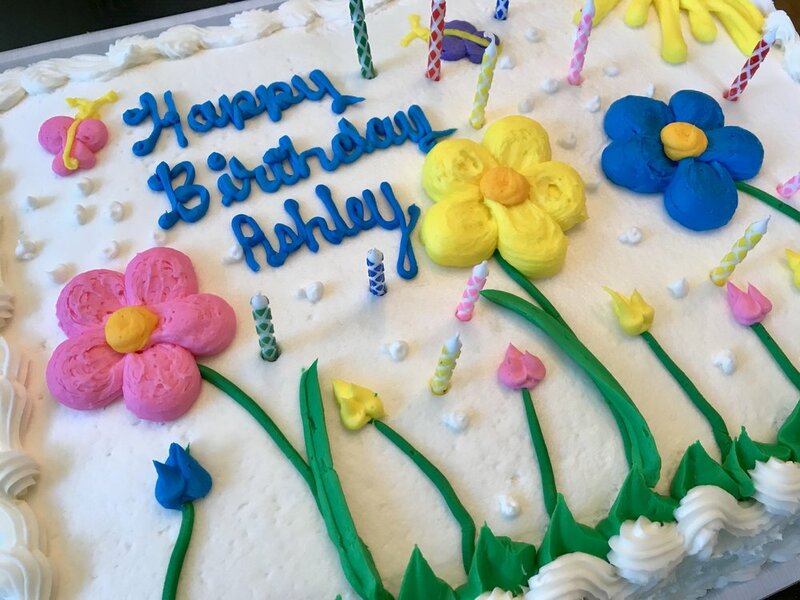 We also celebrated our friend Ashley’s birthday with cake and what were to be candles but sweet little kid fingers found the cake before we could sing. Like I said, times have changed. Earlier in the week we went to the 616 Homes March Madness Kickoff Party downtown at Peppinos. The event was kid friendly including the bracket challenge which means Jeff filled out a bracket for Natalie and Thomas that I’m 90% sure was based off team mascots. I’m sure their bracket is doing super! This is the second year 616 Homes owners Mark and Jamie (spoiler alert - she’s my golf partner) have hosted the event and we were happy to accept the invite. I failed to take any photos so you’ll just have to build your own picture of all the pizza, beer and the kids tinkering away with paints and toys in the corner booth. Go Team 616 Homes! On Wednesday we had tickets to Book of Mormon at DeVos Performance Hall and laughed till our cheeks hurt. It was the second time we’d see the show, the first was during a trip to London. I couldn’t remember the plot but knew we had found it utterly hilarious which is why we went again. The show is completely and utterly inappropriate and they make fun of just about everyone. You have to watch it with that scope in mind and go into it knowing nothing is off limits. If you’re into that sort of humor, we highly recommend it. We also recommend the newly renovated lobby bar in the Amway Grand Plaza, Rendezvous. We were aiming for Lumber Baron Bar but it was closed for a private event and in an effort to get a cocktail sooner rather than later, we landed just down the hallway at Rendezvous. I do like the updated furnishings but I kinda missed the sunken circular bar that was there before the reno. Despite the new bar shape, they did a great job with the update and we’ll likely return at some point. We also recently tried out Paddock Place in the Cherry Hill Neighborhood. Formerly called Mangiamo and still operated by The Gilmore Collection, we were loving the vibe! Jeff and I still have a soft place in our hearts for this spot as it’s where we had our first date. They kept the back room with the fireplace and soft seating but added more tables which were all full the night we went. In the front bar area they added a bunch of booths and smaller high top tables - the place where it all began! They offer sharable plates for under $10 and drinks for $8. Between the 4 of us we shared a couple pizzas and two other apps and thought they were all great. My favorite was the flatbread with the dates and prosciutto - a little sweet and salty is always the perfect combo! We cannot wait until the patio opens. We’ll be walking there with the kids for happy hour very soon. Two Fridays ago I joined some gals from the neighborhood for a night of all female laughter at the Pump and Dump Show at 20 Monroe Live. The show was a solid mix of music, video and comedy put on by Moms Shayna and Tracey, BFFs since 8th grade. What!? We laughed HARD at songs like, “When I Die, I Want to Come Back as a Dad’ and ‘Eat your F’ing Food’. They consistently referred to all Dads as ‘Mother F’ers’ and all the audience members as ‘Breeders.’ It was good. In other news, Natalie is still a complete girl (always preferring pink) while Thomas remains all boy (except for his obsession with the hair dryer) and will celebrate his 2nd birthday this weekend. I can’t make this stuff up. Keep thinking Spring, my friends. The sunshine is here!